At first, the Cathedral of the Assumption in Sedlec seems almost austere, right up until you notice the lovely stained glass, ornate ceiling medallions and intricately carved altar. 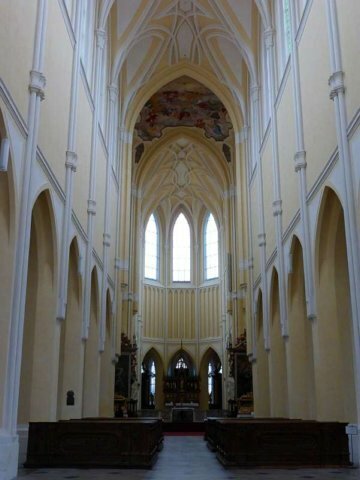 Its architectural style is called Baroque Gothic, and that pretty much sums it up. (c) 2016, Jessica Thompson Blatz, all rights reserved.